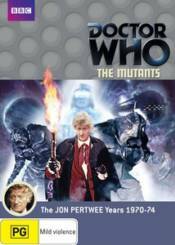 Starring Jon Pertwee as the Third Doctor. When a strange message pod turns up at UNIT HQ, the Doctor and his assistant Jo suddenly find themselves involved in another dangerous mission for the Time Lords. The TARDIS takes them to Skybase One above the inhospitable Solos. It is the 30th century and the planet is about to gain independence from Earth�s glorious empire. But someone on Solos has other plans and, alarmingly, the natives are slowly mutating into fierce-looking creatures. It�s time for the Doctor and Jo to find out why.